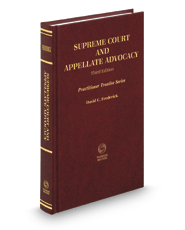 In the Third Edition of this practical guide on preparation and presentation of oral argument before Justices of the U.S. Supreme Court and other appellate judges, the author seeks to build on new insights gleaned from his continuing practice as a Supreme Court and appellate litigator. One of the new sections of this book concerns learning styles, the concept that each person learns and masters new materials in somewhat different ways. Another new section charts the rise of female advocates in the Supreme Court Bar, a development that began in the mid-20th century and has blossomed in the first decades of this century. The chapter on questions has been reorganized to develop more comprehensively the reasons why justices and judges ask questions at oral argument. More generally, the Third Edition seeks to update and refine examples from actual arguments, as well as explain newer rules that SCOTUS and the U.S. Courts of Appeals have adopted. Throughout, the author has added new insights about particular aspects of oral argument, from fashioning openings in different circumstances to handling closing and techniques for managing rebuttal on the fly. The discussion of notes and argument binders also contains updated views about being better organized in the courtroom to maximize precious time. Although many older examples remain in this edition, new examples are sprinkled in throughout and new insights and experiences are described.